This week’s alumni spotlight falls on Paula Navarro of Spain. Paula attended Brillantmont International School from 2005-2008 and is currently working at Clifford Chance Lawyers in Madrid. The following is a short interview we conducted with her about what she does today and how attending boarding school helped her get where she is now. Hearing from the people who have attended Brillantmont about how the school impacted them will help incoming students know what to expect and where a BM education may lead. What did you do when you left Brillantmont? "In terms of education I did the following: when I first left Brillantmont in 2008, I started my Law Degree at the Universidad Carlos III, in Madrid, which I finished in 2009. Afterwards, I did LLM for a year in Universidad Pontificia Comillas(ICADE) - in Madrid as well- which I finished in 2010. " 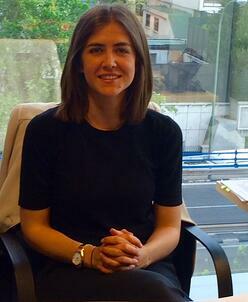 "I work as a lawyer in the Real Estate Department of an English firm named Clifford Chance. I work in their Madrid office. I joined Clifford Chance two years ago. I previously worked for Linklaters, S.L.P (also an English firm) and Deloitte. Real estate finance transactions, advising borrowers, lenders, issuers... on domestic and cross-border real estate financings, refinancing and restructurings." "Brillantmont helped me get to where I am today in many ways, for example, it offered me academic prestige, gave me an international perspective on life, and the opportunity to make friends from all over the world. I was also able to learn languages while there (English and French). All of these things has been very useful as I initiated my professional career. I find that having studied at Brillantmont, one of the best and most prestigious boarding schools in Switzerland (and in the world), turned out to be very helpful on a curricular level in order to achieve both my academic and professional goals." What advice would you give to someone thinking of attending boarding school at Brillantmont? "I recommend Brillantmont to everyone I know (it is no coincidence that my sister is attending the next year). But I would advise them to work hard and enjoy the experience and the wonderful opportunity that our parents have offered us to the fullest. Take the opportunity to meet amazing people from all over the world who will become your friends for a lifetime." Thanks to all our supportive alumni from across the globe for sharing their stories with us as part of this series. Paula has found a wonderful career where she utilises the skills, languages, and global perspectives she gained at boarding school in Switzerland. If you are considering Brillantmont and have additional questions, please contact us directly. Please look out for further alumni perspective blogs coming in the next month and check out our first to posts below.